St. Peter’s Church has a 13th century tower and a 14th-15th century nave and chancel. 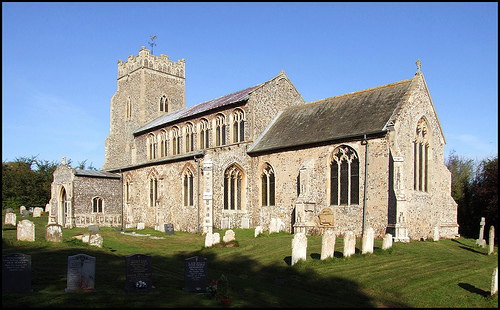 One of the most artistically and historically significant churches in Norfolk, Ringland church exhibits the finest qualities of late-medieval grandeur on an intimate scale. The first indication of this is the wonderful nave roof. There are similar roofs at St. Peter Mancroft in Norwich and Framlingham in Suffolk, both much bigger churches, but neither of them has anything like the impact of the roof here. The hammer beams are disguised by coving, with flights of angels punctuating the coving, and supporting the wallposts. The coving lifts the roof as if it were floating in space, and beneath the coving is Ringland's famous clerestory . As if all this were not enough, set into the clerestory is one of central Norfolk's best collections of late Medieval stained glass.